Touch Base with New Hires Before Their Start Date. You’d be surprised how many candidates accept an offer of employment and then get the silent treatment between their acceptance and the day they walk through the doors of their employer for their first day. This sends exactly the wrong message! Whether it’s an email or phone call or another method, let them know what they can expect on their first day – and it should be more than a pile of paperwork! 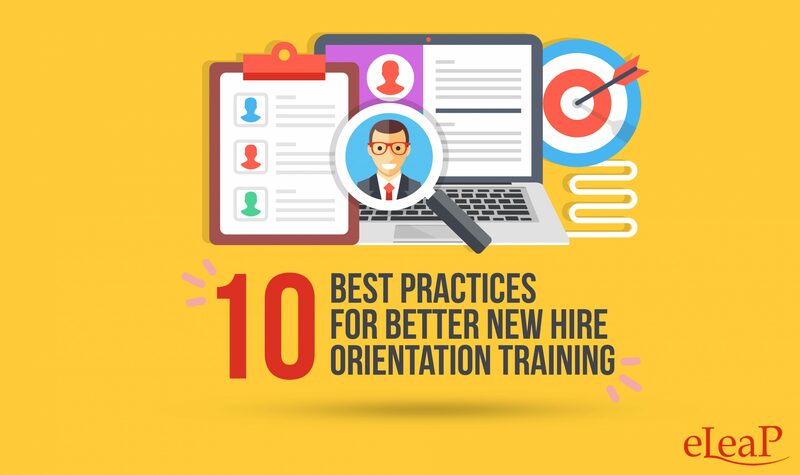 This is one of the most overlooked best practices for better new hire orientation training. Make a New Hire’s First Day Memorable. What you want is to have your new employee feeling energized and engaged after their first day, not overwhelmed and frustrated by too much information and not enough socializing. Keep in mind that this is going to be the day that forms a lasting first impression of what their new job is going to be like, so make it enjoyable and memorable while still accomplishing the goals of the program. Use the Buddy System. Ease newly-hired employees into their new world by making sure they have a “buddy” or mentor – someone who knows the company really well and exemplifies everything the business wants to see in its hires. This is the person who will help the new hire make sense of what might otherwise be an overwhelming day by giving them the inside scoop of how things work. Keep the Schedule Tight and Well-Defined. How long will your better new hire orientation training last? It’s understandable that the program will be highly structured at the start, during at least the first week or two. But elements of onboarding should be present long after that, even as you relax the tightness of the schedule as the employee is integrated into the day-to-day flow of work. Make it a Team Effort. Beyond the buddy system mentioned earlier, better new hire orientation training programs will have a whole cross-departmental team helping to shepherd the new employee through the process. HR/compliance, management, IT and other major departments should play key roles in your onboarding process. Pace the Paperwork. Yes, there is a ton of paperwork that has to happen during onboarding. But does it really all have to happen at once? This is what can really kill an employee’s first day. If you want better new hire orientation training, spread the paperwork out over the employee’s first week. Look at all your company’s individual pieces of paperwork and rank them in order of priority so you can divide it up over at least several days. Set Great, CLEAR Expectations. One thing that can prevent a new employee from quickly becoming the peak performer your company needs is when they don’t understand their performance goals early on. Set those expectations right away, and keep referring to them often so it is crystal clear what is expected of a new hire. The goals clarity – vagueness is your enemy! Get Their Feedback. Few things make any employee feel more valued than when the company solicits their feedback (and takes it seriously). Besides, wouldn’t you like to know what kind of impression new hires are forming about the business? They’re in a unique position to provide an outsider’s perspective, so give them plenty of channels for honest feedback. Ask about the onboarding experience too as this can help take additional steps for better new hire orientation training. Align Them to the Culture. Unless your recruiters are totally missing the mark, your new hire probably has the skills and knowledge needed to perform their job. The bigger hang-up might be more around the organizational culture, personality and work habits. Yes, this can also be something to include in the recruiting and hiring process with various pre-employment assessments, but it can also be part of onboarding. A new hire doesn’t have to be a perfect fit as long as you can convey the culture and get them aligned with it during orientation training. Gamify Onboarding. Gamification has been shown to be a great way to boost engagement with any learning effort, and it can definitely be applied for better new hire orientation training. You don’t have to go overboard with this, but when you find ways to add elements of gaming to your orientation program, your new hires will appreciate having some fun along the way. One way to think of the 10 best practices for better new hire orientation training outlined above is called the Four C’s – Compliance, Clarification, Culture and Connection. Every element of your onboarding program will address one or more of those needs. Keep them in mind as you shape and change new hire orientation training at your business and you’ll be well ahead of most companies – and reaping the benefits of better retention, productivity and fit for your new employees. When a new hire gets the “red carpet treatment” they will immediately feel comfortable and valued, which means they’ll want to show that they’re worth the effort by performing well. Copyright © 2019 NewHireOrientation.net & Telania, LLC.